The Epistle reading this week, Romans 12:9-21, contains some of the loveliest passages in all of Paul’s writings. Indeed, one might say that these passages are Paul’s equivalent of Jesus’ Beatitudes, as these are very similar in both style and in spirit to the teachings Christ gave in His Sermon on the Mount. Indeed, in many ways what Paul is doing here is telling us that while God will “bless” many of the downtrodden, we ourselves are called to emulate God in doing so — by bestowing our own weak substitutes for “blessings,” namely our loving spirit and goodwill, upon those very same downtrodden. “Blessed are those who mourn,” taught Christ, and likewise Paul exhorts us to “weep with those who weep.” (When Christ says “they shall be comforted,” Paul says in effect that we should help provide the comfort.) And as Christ says “blessed are the meek,” Paul tells us to “associate with the lowly.” And so on. What I’d like to concentrate on in particular, though, is Paul’s use of a turn of phrase that these days is becoming at least slightly archaic. 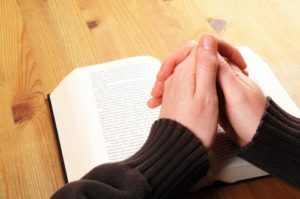 Paul writes that we should “hold fast to what is good.” It is a phrase he likes: Paul also uses it, in much the same context, in Thessalonians 5:21. Paul, of course, uses it in that latter sense, the one largely unfamiliar to younger people, of not easily moved….